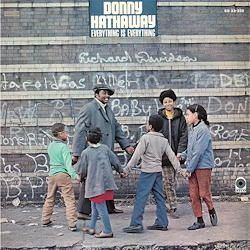 "Everything Is Everything" - ﻿Donny Hathaway (arr, voc, keyb, b); Johnny Board (ts); Clifford Davis (as); Robert A. Lewis (tp); King Curtis, Phil Upchurch (g, b); Louis Satterfield (b) Ric Powell (perc, dr); Morris Jennings (dr) & The Vashonettes (voc) a.o. ﻿Many a musical career began in the gospel church choirs of the black communities, but that of Donny Hathaway must certainly be one of the most meteoric. Rolling Stone magazine named him the 49th greatest singer (of 100) of all time, though this might sound somewhat abstract. But just the very first few bars of the opening number "Voices Inside" promises a programme in which the instrumental and human voices are on a par. Just listen to the impressively saturate sound and clear phrasing of the wind instruments which range from discreet to brassy. Spiced with peppery volleys on the clavinet, Hathaway’s soul sound breaks into new ground with harmonically fresh blues ("I Believe To My Soul"), soars passionately upwards ("Misty") and ploughs through a percussive, dry and cheerful confusion in the number entitled "Sugar Lee". Every single arrangement profits to the full from the excellence of the musicians and each number is therefore quite unique. Softly cushioned, melodious togetherness ("Trying’ Times") seems just as natural as prayer-like gospel song ("Thank You Master For My Soul"), which ventures into the realms of free jazz harmonies to the glory of God. To round off the album we once again hear Hathaway’s voice, smooth and soaring, right up into the top register, in the short number "A Dream" – an apt description of the whole album.